If catching waves isn't on the menu for today the Montauk Rope Hammock from Yellow Leaf Hammocks offers a very tempting consolation prize with an eye towards style. Here, in addition to echoing the color palette of the rug, the texture of the cotton-rope hammock plays with the texture of the chair and stacked, woven ottomans. Meanwhile the texture of the lambskin rug in the hammock complements the texture of the rug for a cohesive look. Small bedrooms can still offer big comfort and big style. In this room Yellow Leaf's Lanta Hanging Chair provides the major pop of color in the room. Placing a big colorful piece in the center of the room lets the primarily neutral palette of the rest of the room act as a balance, providing additional colorful moments while still keeping things under control. More importantly, this unique kind of "floating" seating is a comfy alternative anytime the climb to the bed is just too far. In this room, a hammock gives an otherwise glamorous space an approachable, laid back vibe, while maintaining an upscale look. 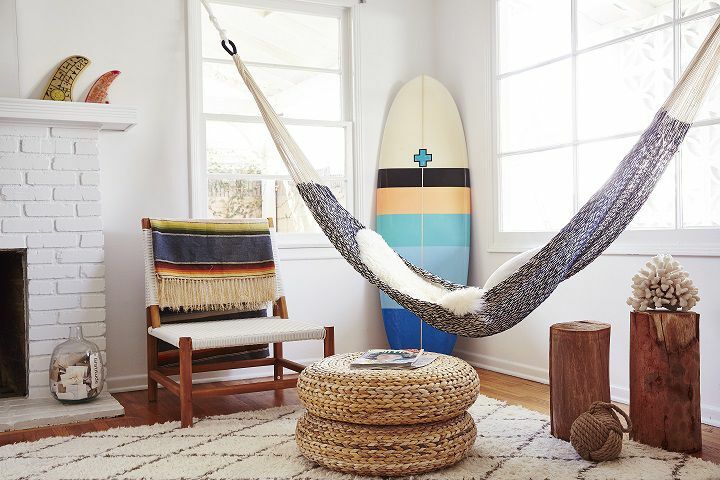 Playful notes like a hammock can tone down a room to keep it from becoming too serious. And when you want to relax, you can do it in luxurious style. If you're looking to relax in a room that takes you away from the everyday, the Macrame Hammock from Urban Outfitters offers comfort with a note of whimsy added in for effect. With macrame trimming hanging from both sides, this cream-colored, lacy hammock has a global feel that fits perfectly in a space with a global, bohemian vibe. This room is a beautiful take on modern global decor. From the traditional Indian charpoy beds in the background, the inset wall and blank fabrics hanging on lines like prayer flags, everything in this room evokes a global flavor. In the middle of it all, the artisan, hand-woven feel of the hammock completes the scene. The rough-spun texture of the hammock, together with elements like the charpoy bed and the hanging poster give an earthy, rustic feel to the space. This room certainly has the right idea. Instead of a traditional lounge area, this space takes relaxation to the next level with an indoor hammock complete with books and a fully stocked bar cart all within arms reach. In addition to a good hammock, bringing this look to your place will require a simple, relaxing color palette like the blue, white and green palette seen above. Mix in natural elements like the potted plant, and combine colorful elements like the pouf, hammock pillow and the bowl on the bar cart.